Priyanka won the first place at the Research Poster Competition during the postdoctoral research day at the University of Miami. 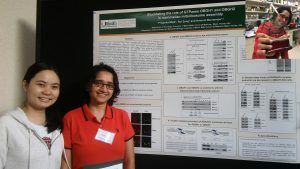 In her poster, Priyanka presented the progress on her ongoing research on the role of proteins OBGH1 and 2 on the assembly of human mitochondrial ribosomes. Her research topic, results, and presentation skills were considered as the best among more than 50 participants in the competition.